Children under 16 in South Korea have been ordered to stop playing video games late at night, but it doesn't seem to be working. After about a month of the law being in place, kids are finding ways to sneak onto the banned games and usurp the ban. The law, which is also known as the "Shutdown Law" or the "Cinderella Law," forbids kids under the age of 16 from playing online games during the nightly shutdown. Depending on what gamers chose, that can be between midnight and 6 a.m., 1-7 a.m., or 2-8 a.m.
A panel commissioned by South Korean video game website This Is Game suggests there has been little impact on kids' playing habits, as many instead sign in to their parents' accounts in order to keep playing online games, which are the focus of the ban. There's also no enforcement in place for single player games without an online component, although the biggest problem in South Korea is the addition to MMORPGs. "All of my friends and others well know about the Shutdown system," said Maemi in the study, as quoted by TechPowerUp. "But all of them said nothing would change because we all could still either play the online games with our parents' IDs or play other games not under the policy such as console games or mobile games. This system is meaningless. Moreover I heard that the system was to guarantee our right to sleep, but we cannot sleep not because of the game but overwhelming amount of study. I honestly cannot understand why this policy exists." The law was introduced by the Ministry of Culture, Sports and Tourism (MCST) and the Ministry of Gender Equality (MGEF) in an effort to curb the widespread game addiction in that country. According to the Huffington Post, a survey of 1,500 public school students in South Korea found nearly a third of female students showed signs of game addiction, while 40 per cent of male students exhibited the same. 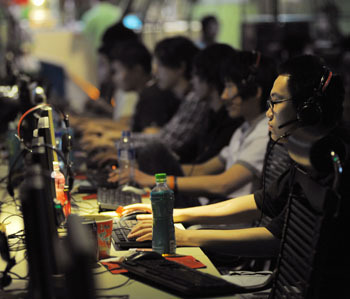 The primary focus of the ban is on PC gaming, with 19 popular role-playing games (representing 79 per cent of South Korea's domestic game market) being impacted by a secondary aspect to the law: after several hours of play, the Internet connection speed will drop dramatically. Big gaming companies like Microsoft and Sony agreed to abide by the ban, preventing users under the age of 16 (according to their accounts) from logging on to PSN and Xbox Live during the restricted hours.